I recently shared something very private in a very public forum. It may even be something you do, too. No, it wasn’t a deep dark secret – it was my monthly subscription spending! Yes, I’m that person. I have gym memberships, product deliveries, online movie service and several other monthly fees that totaled more than $200 per month. My financial habits were put on display recently during a webinar ExamOne hosted about Millennial purchasing trends. 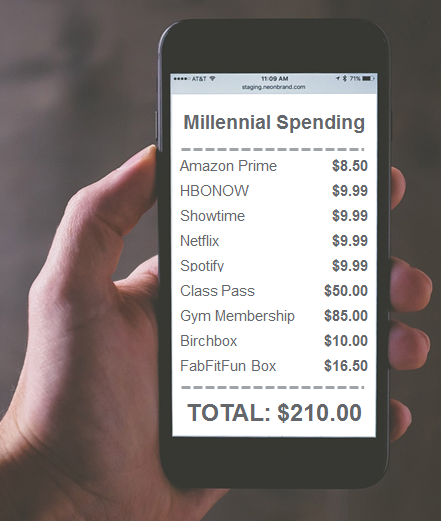 Since I was born between 1981 and 1998 and am a Millennial myself, I shared this information to give a first-hand glimpse into my spending habits. We have been called the “subscription generation,” but do you know what isn’t on many Millennials’ monthly spending list? A monthly life insurance premium isn’t always a priority. Why is that? According to the 2017 Insurance Barometer study*, three out of four millennials (73%) overestimate the cost of life insurance. On average, they incorrectly assume life insurance costs three times more than it does. This misperception is likely dissuading them from considering becoming protected by life insurance. Life Happens states that a healthy 30-year-old can get a 20-year $250,000 term life insurance policy for about $13 a month. Most of my disposable monthly fees are around that price, but to be honest I didn’t realize it was as comparable as it is. I also think many younger people don’t realize that they could be getting the best rates and coverage when young and healthy. Another thing I found interesting in my research was that 50% of Millennials say no one has approached them to buy life insurance. Yes, my generation conducts most research online, has high customer service expectations, and can be picky about brands we buy, but we also appreciate advice from an expert. The Insurance Barometer study found 42% of Millennials surveyed want to buy life insurance through an agent or advisor. So instead of making fun of the box full of outfits, toys and treats for their pets some Millennials have delivered to their door every month, engage us in a conversation about how life insurance is an important step in our financial maturity. Show us the importance and affordability of such a decision. It’s a subscription for protection. I’ll buy that. For more purchasing and laboratory trends of the largest generation in our history, watch our on-demand webinar. You will see insight behind my (now very public) list of monthly Millennial “necessities” and how my generation decides where to spend our money.